Wondering why I started this blog? As a multi-passionate creative, I used to be plagued by the idea that success meant choosing one thing and sticking with it. The problem was choosing just “one thing” left me unable to show up in the world as my most authentic, full self. One day I woke up and decided to finally embrace and share all of my gifts. My next thought: I should start a blog as a space for my passions to play. I never looked back after that moment. Welcome to the mind of a bonafide “plant mom.” I love and adore my houseplants as if they were they were my children! It’s so rewarding to nurture them and watch them grow. I care for my plant babies as best I can, and in return, they offer their beauty, purify the air in my home, and bring life to my space. In my post “The Only Houseplant You’ll Ever Need,” I share a suggestion for one of my favorite, most versatile houseplants. Since then, my plant family has grown quite a bit, and so have my plant care strategies. As always, when something works well for me, I’m eager to share with all of you. Keep reading to find out my 12 tips for happy houseplants! This advice is very important especially to new plant-parents; be realistic. If you only have a small amount of space, don’t start with giant Fiddle Leaf Fig. If your room doesn’t get much light, choose a shade-loving plant, rather than one that requires a lot of sunshine. If you’re new to the plant game, look for easy to care for plants, such as Pothos to get you started. In short, be honest with yourself about the amount of space you have for your plants, the light levels of your home, and which plants you are comfortable caring for. Alternatively, you can get a plant-care book (or two) to reference anytime you bring a new plant home. My favorite plant care book is Urban Jungle. It not only has detailed profiles for various houseplants but offers a wealth of inspiring images and creative ideas for how to display your plant-babies. All pots are not created equal. While it’s easy to overlook the way the pots you choose will affect how you care for your plants, this is something to consider. Take for instance, the difference between clay pots and plastic or glazed pots. Terracotta pots are a favorite among the plant-care community because they are made of porous clay and absorb moisture. These pots can help your plants stay healthy by pulling moisture away from the plant which can prevent root rot. Note: “Root rot” occurs when plants have been overwatered to the point where their roots become water-logged and rot. This prevents the roots from being able to absorb any more water, ultimately killing the plant. I especially enjoy the way terracotta pots develop unique characteristics as they age. Terracotta is a great choice for any plant owner. However, if you decide to plant in these clay pots keep in mind that your plants will dry out more quickly and may need watering more often. Glazed ceramic, plastic, and some decorative pots are not absorptive. So if you choose to plant in these kinds of pots you can water a little less often, making sure not to overwater. If you’re new to plant-care, always choose pots with drainage holes, which allow excess water to flow out of the pot. If you choose a decretive pot without drainage holes, compensate by placing a layer of pebbles in the bottom of the pot to create a space for excess water to flow without touching the plant’s roots. While we’re on the topic of water…knowing when to water your plants is essential to keeping them happy. Some plant parents stick to a weekly watering schedule for all of their plants, choosing one day per week to water. Creating a schedule is okay, but I suggest that you always check the moisture level before watering, always. No matter what day it is! You can stick your finger about an inch into the soil to check for moisture, but if you want to step your plant-care game up, invest in a moister meter. This device is very inexpensive and is super accurate. It has stopped me from overwatering many of my houseplants. The long stem of the meter also makes a deep hole in the soil which can help water penetrate more easily. To see more about how I use the moisture meter, check out my “Plant” highlights on my Instagram page. While we’re on the topic of moisture, let’s talk about adding a little humidity to the mix. Most plants, especially tropical varieties, prefer a humid environment. You’re replicating their natural habitat by adding moisture into the air (which makes your plants very happy). This is especially helpful during the dry, winter months. The best way to do this is to invest in a humidifier which will release a steady stream of moisture into the air for hours at a time (also great for allergies, respiratory health, hair, and skin!). Another option is to mist your plants with a spray bottle or place tropical plants in the bathroom since it is a naturally humid environment. Put your personality into the way you pot and display your plants! The more creative you get with your planters and your styling, the more you will fall in love with having houseplants. Don’t be afraid to think outside the box. Plant a cactus in a teacup. Put an air plant in a teeny tiny pot. Look for fun vintage trinkets you can use as planters. Go wild. Be YOURSELF. There are no rules. Of course, I always like to mix crystals into my plant displays, they look great together! Okay so this isn’t really a tip for happy plants, but you can boost your plant-care-confidence by adding air plants to your collection. And plant-care-confidence will make you better at plant care, which will make your plants happier (see what I did there?). Air Plants require very little attention and have a LOT of personality. The best part, they don’t require soil to live! They do need to soak in room temperature water for about 30 mins, once a week. After you soak them, shake off any excess moisture and put them upside down on a paper towel in a sunny spot so that they can dry completely. Air plants also offer an opportunity to get super creative with your styling. Since they don’t require any soil, the possibilities are endless! Pictured below are a few of my air plants in a vintage sugar canister. Another way to boost your plant-care-confidence is to grow an entirely new plant from a clipping of an existing one. This process is called propagation and while there are a few ways to do this, water propagation is my absolute favorite. Watching cuttings take root in water is a magical experience and some plants can thrive in water alone! Once the roots of your cuttings are established, you can move them into a small pot with some soil, and grow an entirely new plant. It’s a beautifully easy process that every plant-parent should try at least once. You can give your plants all the water they need, and even fertilize them during the growing season, but if you don’t care for the leaves of your plants they will not be happy. Indoor plants need clean leaves in order to properly absorb the sunlight they need for photosynthesis. Always remember that sunlight is a huge source of your plant’s happiness! Use a microfiber cloth to gently wipe away the layers of dust that settle upon the leaves. This ensures maximum absorption of that delicious sunshine. You can do this about once a week, or whenever you notice dust settling, causing your plant’s leaves to look less shiny. One of my favorite things about being a plant-mom is the community that comes with it. 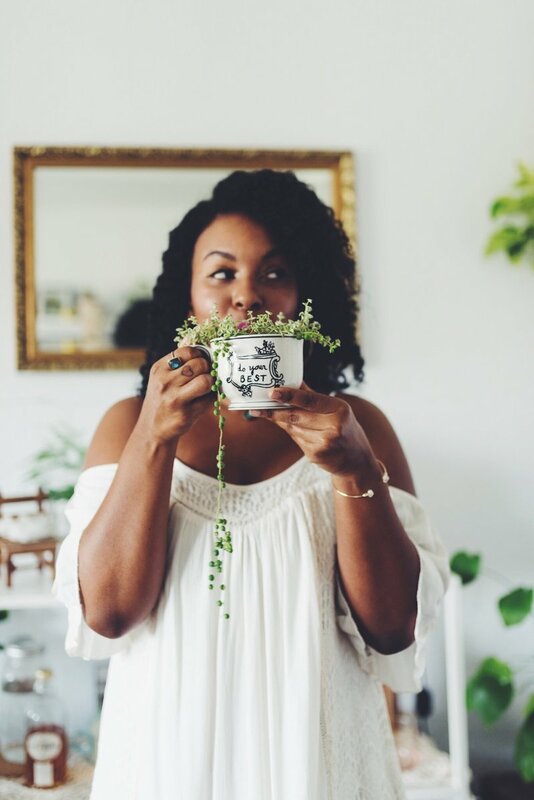 There are so many amazing plant themed Instagrams and blogs out there that can help you connect with fellow plant-lovers. I follow several stunning plant feeds that offer endless inspiration and helpful plant-care tips. You can also start a plant Pinterest board, and follow mine here. The more often you see beautiful images of houseplants, the more excited you’ll be about your own indoor jungle. Who knows, maybe you’ll even snap a pic or two (tag me if you do so I can see). Some plants simply cannot handle the shock of transitioning from a highly humidified nursery with expert care, to being in your home environment. Other times you will try everything you can only to watch a plant whither away. If a plant dies on you, it’s okay. Learn from the experience. Perhaps go back to tip no. 1 and assess whether or not the plant was realistic for your home to begin with. If you suspect one of your plants is dying, snip off a clipping and place it into some water to give it a shot at new life via propagation. Then, move on. Know that you tried your best, and look on the bright side: it’s a perfect excuse to bring home a new plant-baby. Grab a bestie and go visit a nursery together. Bonus points if you grab coffee after. Get a plant-twin with a friend (meaning you both get the same plant on the same day) and share pics of their progress with each other. Experiment with exchanging clippings with friends or creating plant-care packages (more about this in an upcoming post that I’m working on with one of my best plant-friends). If nothing else, tag me on Instagram with a photo of your plants so that I can be your plant-pal! For a list of easy to care for houseplants, check out this post from The Houseplant Mama, while you’re at it, check out her post about water propagation. For more information about my favorite (and easiest to care for) houseplant, check out this post. Check out this post to learn how I style Pothos clippings in water. For a wealth of resources for both indoor and outdoor gardening, check out BlackGirlsWithGardens.com. To learn more about my journey into plant-motherhood, read my BGWG interview here. That’s it, babes! I hope you enjoyed my 12 Tips for Happy Houseplants. If there is a specific question you have, be sure to leave it in the comments so that I can answer it, or jot it down for a future post. If you liked this post, please share it with a friend! *The majority of the photography in this post is by Morgan Pirkle. You can see more of her work at Keptrecord.com. I was so excited about reading this post that I went to pin it on pinterest and realized that I never even clicked out of my email notification. Couldn’t figure out why it wasn’t working and realized that I was still in my emails! Not gonna lie, seeing your plant babies on your Instastories all the time is what pushed me to finally make the leap and get some real plants for my room. Hey Jas! It’s always a pleasure. I’m so thankful our paths have crossed. Air plants are super unique and fun! Definitely worth a try. xo! Aw I’m so glad you found this post helpful. Thanks so much for reading! I’m glad I waited for this. I can’t wait to twin plant with you! What a beautiful + detailed post! Usually posts like these are just infographic but you gave such great suggestions and advice! Pinned! Hey Katie! Omg I’m sorry my reply is so late! I somehow missed your sweet comment. Thanks so much. I always strive to balance the imagery with sound advice here on my blog, so I really appreciate you recognizing that! Heading over to your blog to take a look around. xo! These are some good tips. I can’t keep plants alive to save my life (no pun intended). I even killed an ivy. I’m going to try out some of these tips because I like having plants in my house and office, but I am not someone with a green thumb lol. Thanks for sharing. Great Post! I’ve been needing to add some greenery to my house for quite some time. My mom has lots of plants but I don’t think she pass along her green thumb to me. I’ll be bookmarking this post so that I can reference it when I’m making my plant selections. Helpful tips!! Especially for someone completely new to having house plants. Once I get all moved into my studio I’m looking to grab one. Everytime I bring a new plant home I always look up how to care for it as well. I also joined a few groups on Facebook that discuss and share photos and information on plants and succulents. This was SO refreshing to read. My grandmother was an amazing gardener and I hope to follow in her footsteps someday in the future. I’ll definitely be using your site as a resource when that day comes. Beautiful blog, btw! First of all, I absolutely LOVE the look of your website! I’m not a very good plant Mom to be honest. I have a new plant now, I will definitely keep your tips in mind with it! My favorite tip of yours is getting creative with the display. When it comes to displaying plants, the possibilities are endless! Hey there! So glad you enjoyed this article. Styling my plants is one of my favorite parts of being a plant mom for sure! Best of luck on your plant journey and stay tuned because I’ll have a new plant post coming soon! Loved going through your post and it came just in time for me as I was looking for some ideas to upgrade my balconies. I love plants and I am going to refer to all your posts just in case I need to know more.. thanks. What helpful tips, you seem to have a fantastic green thumb. This has inspired me to try my hand at more house plants. Okay I have to be honest…I wouldn’t know how to raise a house plant if I tried! Lol. But this post was so informational. I definitely need to start buying house plants now that I know how to care for them. This post is perfect for those of us who have been deemed “plant killers.” Very educational and informative. I really enjoyed the pictures in addition to the information. Great read! Omg this is such a great post!!! I’ve been slowly building my houseplant collection and it has been such an awesome. I’ve never heard of a moisture meter but I think I’m definitely going to invest in one since I live in a dry climate and have a tendancy to over water which have caused the plants to rot – thanks for the tip! I’m terrible with plants. If it can’t come to me to remind it to be watered, it may just be forgotten. So for now all I have is a bonsai tree with low maintenance. I love plants and this article is really helpful to me to know how to take cake my plants here, thanks! I grew up with plants in the house because of my mom and thought I would give it a go, starting with a little succulent I found shopping one day. It died, but after reading your post, I’d like to try again this year. Beautiful pictures, by the way. I’m absolutely obsessed with my houseplants, but I never thought about investing in a moisture meter, humidifier, or air plants! Thank you so much! This post was very informative, thank you! I have to admit, I have never been that great at taking care of my house plants. My husband has always been on me about the ones we have (only two at the moment). Somehow they are still kicking though. I’ll use some of these awesome tips in the future! ~Sarah (my other half at Kindness Curated and sister, Corinne, is much better at the house plants!) I’ll pass this info to her too! Aw, sometimes its just a matter of finding the right plant! Try Pothos to start, it’s virtually impossible to kill! 😉 Thanks for reading! And so cool that you share a blog with your sister! My pleasure, Olivia! Thanks for reading! Awesome. I’ll keep checking your blog for tips. I want to start a mini garden when we move to a new home in a few months. Such a great article. I am a plant Mom too and my husband and I love our house plants so much for the exact reasons you mentioned. What awesome tips and use of Pinterest. I have not used Pinterest much for my blog but I enjoyed how your incorporated it into your post. Great information and love that we share the same love of plant life. Wondering why I started this blog? As a multi-passionate creative, I used to be plagued by the idea that success meant choosing one thing and sticking with it. The problem was choosing just “one thing” left me unable to show up in the world as my most authentic, full self. One day I woke up and decided to finally embrace and share all of my gifts. My next thought: I should start a blog as a space for my passions to play. Needless to say, I never looked back.